Way way way back in 2010, when we were all but glimmers in our fathers' eyes and still dreaming of the days we'd be knee high to a June bug, How To Dress Well also known as Tom Krell released Love Remains. The album did some amazing things with R&B and melody, but was most notable for the extreme layers of static and fuzz piled over top. In fact, the fuzz, to me, buried any melody there was. So much so that I only gave the album a few listens before turning toward other cacophonous fuzz merchants like Sleigh Bells. 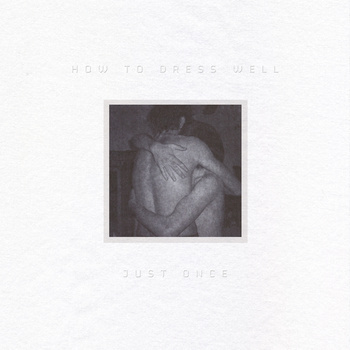 Hearing that this new EP, Just Once, from How To Dress Well, has dialed back the fuzz (more accurately, scraped, raked and chopped it all away like a machete to jungle overgrowth) I had to give it a shot, just to know if I had missed something. Turns out, I had. The EP illustrates, as a companion piece/alternate take on a couple of Love Remains' tracks, that Tom Krell's R&B and Soul sensibilities are turned up to amazing. And save for some minor vocal failings, Just Once is exactly the Rosetta Stone one may need to go back and listen to Love Remains with fresh and understanding ears. On the somber "Suicide Dream 1" Krell pours his heart out and an arrangement of sparse piano and layer vocals gives the song additional weight and emotion. It's a brilliant version and a clearer feel than on the original. This becomes even more pronounced on the beautiful, and really, my favorite on the EP, "Suicide Dream 2," in which Krell's voice is strongest. (Check out the originals via YouTube below.) These end up showing all of the influences Krell has throughout the Soul and R&B world. And the only weakness, really the only weakness, is that Krell sometimes over-extends his voice. But even that only bothered me once, as I was so easily lost in the melody. The relatively huge "Suicide Dream 3" follows. A new song for the EP, it features a hefty string accompaniment. And Krell's voice is a bit more buried here, but the end result is just as beautiful as a sunset, but more sad because you can't be sure you'll hear the song again. The closer is a reworked version of "Decisions" that keeps the beat and a lot of the original layering, but just peels back the fuzz. And it works great. You'll love it. I swear. Listen to How To Dress Well's Just Once EP below, then make a couple clicks and buy a digital copy. Now, I'm gonna go back to Love Remains and listen to it again and again, now that I better know the language.